Lightroom is, by far, the most important program for my photography. But, the concept behind Lightroom is not always easy to understand because of its uniqueness. Lightroom does not carry particular functions like image editing, vector drawing, video composition or video editing similar to other applications. It is, at its core, an application that is categorized as a “workflow” program. What this means is that Lightroom provides a variety of functions from the organizational side like digital asset management (DAM), image development and editing to multiple publishing options (web, print, social platforms). The versatility and uniqueness of Lightroom add complexity for new users. The most confusing concept for people who first use Lightroom is the Import Process. 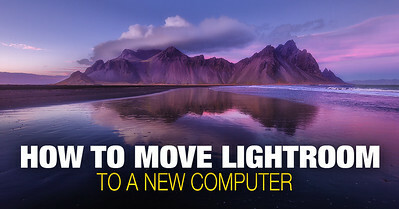 You simply cannot click on the image and open it in Lightroom like you would in other programs. Instead, you must go through the multi-step import process. The second concept that is challenging to grasp is the Export Process. Again, you cannot simply select an image and use the familiar Save As option to save it in the desired format. As is the case with the Image Import, there is a process for exporting. Today’s article is dedicated to making the export process easier to understand and removing the unnecessary complexities. Let’s say that you managed to import your newly taken photos into Lightroom. 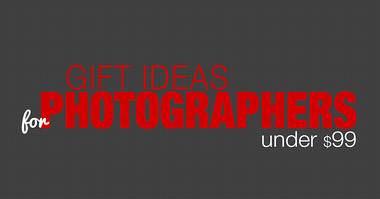 You selected the best images, edited them and added metadata in the form of copyright information and keywords. Now, you are ready to share your photos with the world. This is when the Export Process comes into play. 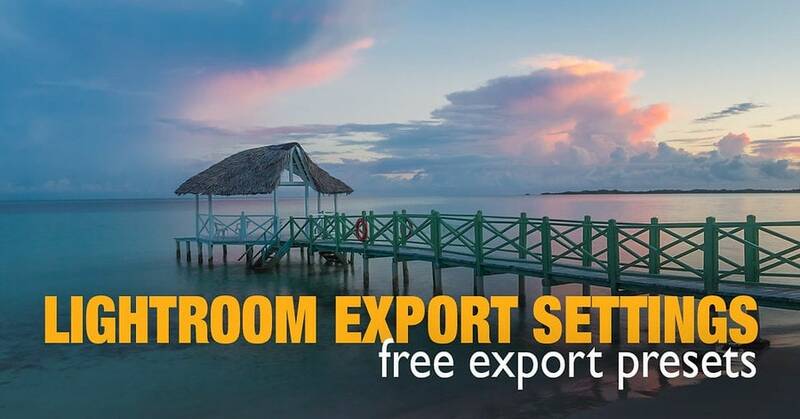 To initiate the Export Process, you must activate the Export Panel of Lightroom. There are three different ways of doing this. Option 1: From the top menu, you can select File > Export. Option 2: You can use the keyboard shortcut Ctrl+Shift+E. 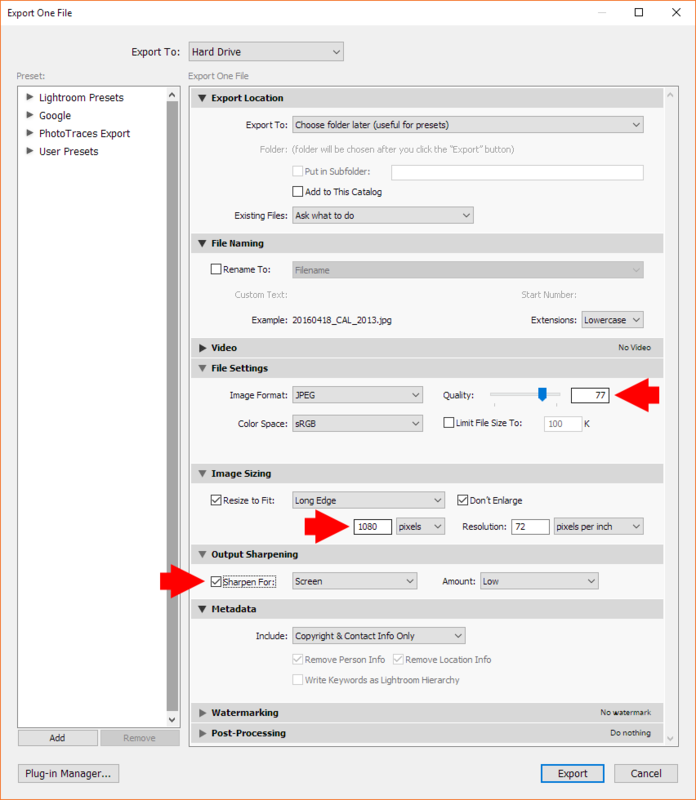 Option 3: You can select a photo or multiple photos in the Library or Develop module, then Right Click (Option-Click) and select the Export option. This is my favorite option and the one I use most often. You will then be presented with the Export Panel. Using multiple options of the Export Panel, you have to tell Lightroom how you want your images to be handled. 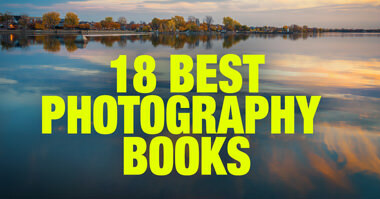 You must specify the location where you want the final image to be saved. This is a required field. Here, you have the optional choice to rename your images. In my case, I rename all my images during the Import Process using the File Renaming Presets, so I skip this step during Export. Since Lightroom has added support for video files, you can specify the Video Format and Quality Settings. But, when you are only exporting images, you can ignore this option. These are probably the most important of all the export options. You need to specify what image format you want your photo saved in, the Color Space, and the Compression Settings. In most cases, you will use JPEG format. If you are not sure about Color Space, choose sRGB. The Compression Settings will vary depending on if you are exporting your photo for web or for print. Here you have the choice to change the size (dimensions) of your image. If you want to save your image in its original size—for archiving, for example—uncheck this option. If you are saving your image with the goal of publishing it to your blog, you definitely need to resize it. 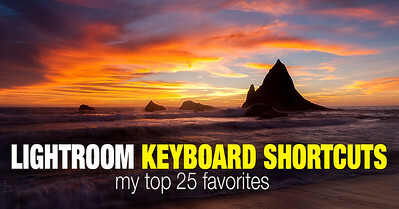 In my case, the layout of my blog is 800px wide, so I resize all my images to a width of 800px. When you resize an image to make it smaller, you always lose sharpness because of interpolation. To compensate, you must apply additional sharpening. When I export images for my website, I always use the screen option with LOW settings. I find that even the Standard setting for small images is too aggressive and introduces sharpening artifacts. Here you can specify what additional information you want to include with your image. But, you have to be careful. If you select the ALL METADATA option, the location where the photo was taken will be embedded. This means that if you took the photo at your home, the information will be public. The Copyright & Contact selection is always a safe choice. But, when I share my travel photos, I want the location information to be shared with my readers, so I select the ALL METADATA option. If you want to protect or brand your image, you can apply watermarks to them. 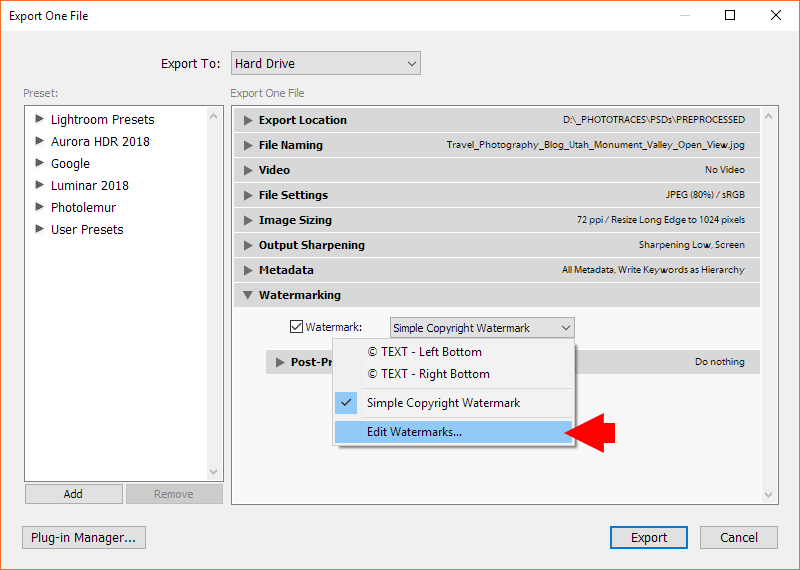 To take advantage of this feature, you need to create one or multiple watermarks using the Watermark Module of Lightroom. 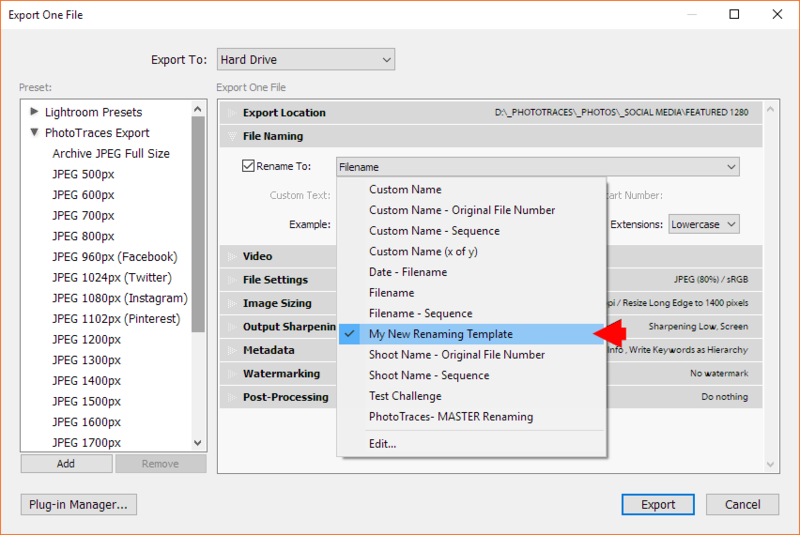 In the Export Panel, select the existing watermark to apply to your photo. In my case, I created two watermark presets—one to be displayed in the bottom right corner of the image and another in the bottom left corner. During export, I have the choice of picking one of the watermarks. I uncheck the Watermark option when I export photos to my portfolio. 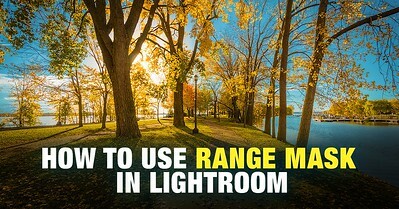 Here you can define what to do with the image after Lightroom exports it. For example, you have the possibility of opening it in the File Browser (Explorer, Finder) or opening it in Photoshop if you plan to edit it further. I always use the DO NOTHING option because I find it more flexible to use Bridge if I need to edit the image in another application. As you can see, the Export Panel can be very confusing and complex because of its many options. 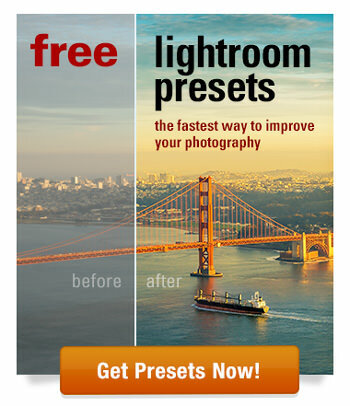 But, the good thing is that you can always take advantage of Lightroom preset functionality. 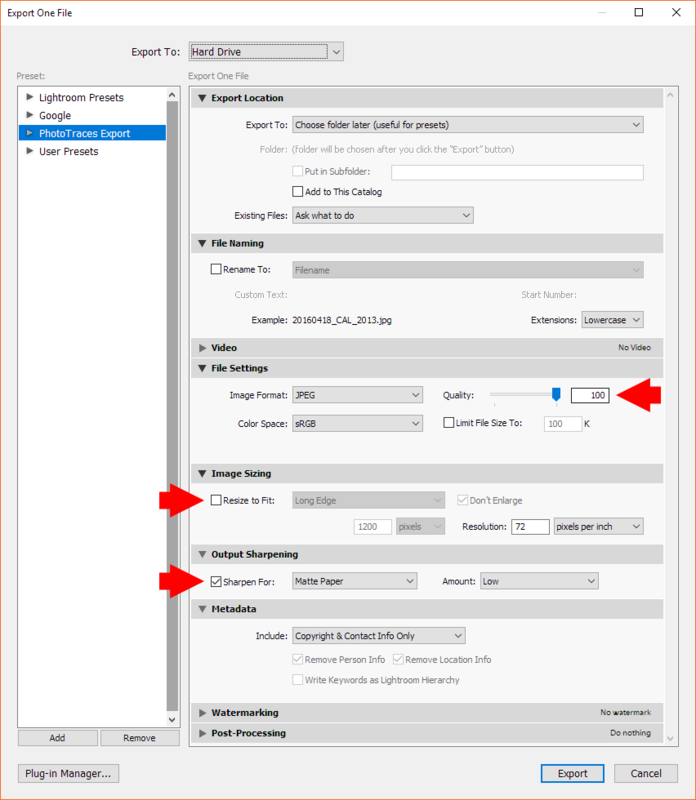 Save your Export Settings as Export Presets to reuse them again and again. I highly recommend creating your own Export Presets that reflect your photography workflow. But, for now, you can see my recommended Export Settings for different photography workflow scenarios. I even created an Export Presets for you to download. They are entirely free! (see the end of the article). Use my presets as a foundation for creating your own Export Presets. The most important setting when saving for the web is JPEG Compression Settings. You need the image to be as small as possible without losing quality. Based on my experience, 77% Compression is the lowest value before the image starts to quickly deteriorate. For size, I recommend 1200px, which is an approximation because I do not know the exact size you need for your blog. 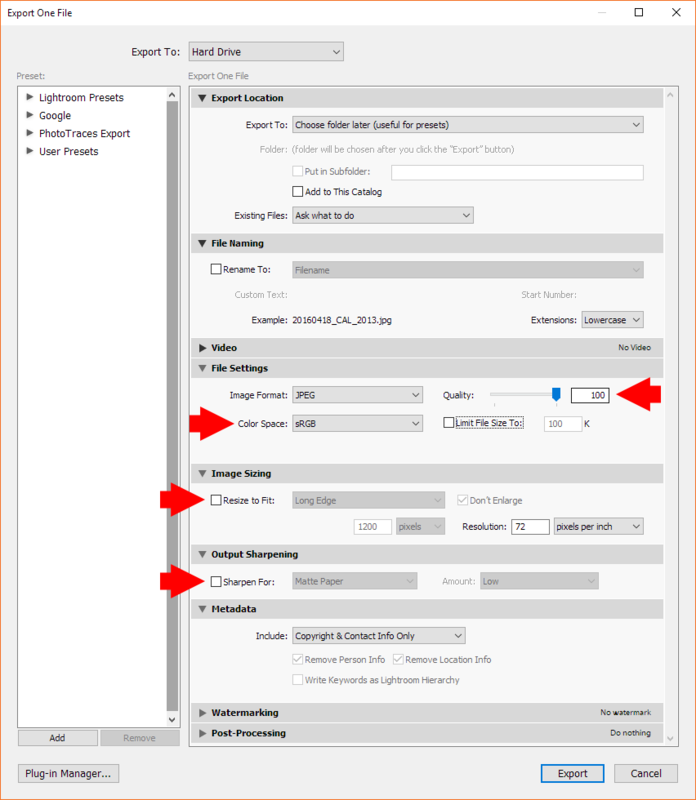 You will likely need to change this setting based on your requirements and resave the preset. 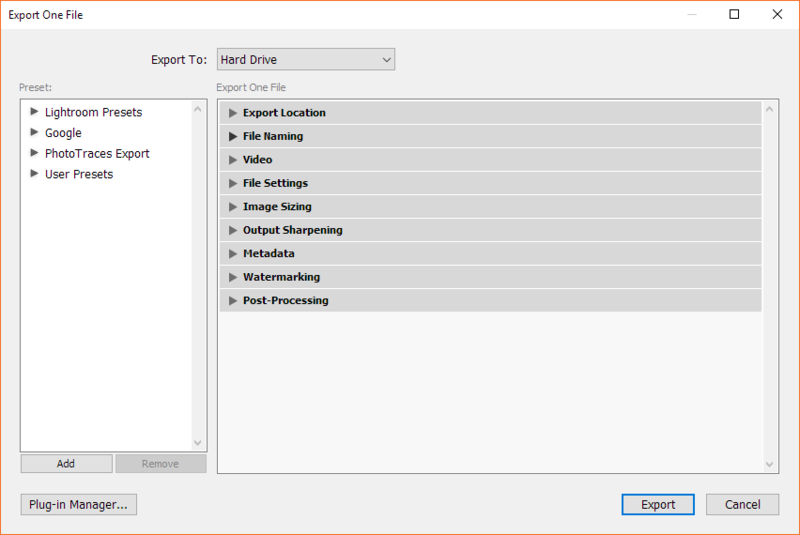 Below are the recommended export settings for print. Use sRGB color space, 100% quality and the print options for sharpening. These are the Export Settings that I use when I archive my images. As you probably know, I use the SmugMug service for archiving, image hosting and online sales. The goal here is to save my final image at its original size and 100% quality so that I can reuse it in the future for different purposes. Facebook is notorious for not handling our photos with care. First, it strips all metadata from the photos and, second, it uses pretty aggressive settings to compress uploaded photos. The goal here is to use the 2048px size at the best possible quality. The goal when uploading images to Instagram is to ensure that Instagram does not resize or recompress them. If you upload images to Instagram that are larger than 1080px, Instagram will resize them. If you save a JPEG photo at 100% quality and upload it to Instagram, it will recompress it to a reduced file size. The recommended settings are 1080px, 77% JPEG compression value. 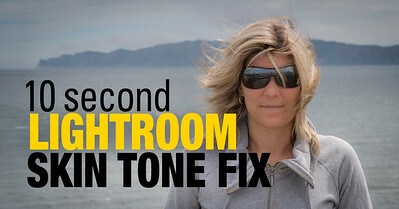 Here you can get my Lightroom Export Presets for Web, Print, Archiving, Facebook, and Instagram.